Oh, where to begin? Hi there, my name is Victoria and I am mom to four (soon to be five!) pretty amazing kids, ages 6, 5, 3, and 2. We’ll have a newborn sometime in February and we are excited! I have been married to my God-loving husband, Eric, for 9 years this year. We live in Northeast Ohio and so we have absolutely zero faith in weather reports! I am a writer of sorts, almost exclusively a blogger at the moment because life is busy! I blog at Verbose Victoria. My husband is a subcontracting electrician and he works hard every day, God bless him. We have been given a very supportive family and circle of friends through our church, although I only know one other family attempting homeschool this year, and they plan to enroll their child back in school next year. I am in love with learning and I plan to encourage my kids to keep their love of learning as well. Feeling “other” amongst people I love has become my version of normal, and I embrace it (for the most part!). My curiosity makes me interested in just about anything, but some things I currently pursue are editing other writers, copious fiction reading, crafting, movie nights at home, studying God’s truth, dance parties in the kitchen, and learning how to be dairy-free and gluten-free when no one else in my family has to be! Our typical day is full of questions and journeys to the answers. That’s about as predictable as it gets! My kids are still very young so we don’t have much in the way of long-term projects. Most recently, I’ve been assigning myself a topic to cover with them each day – Bible, reading, writing/spelling, art/science – so that I can describe what we’re doing to family or close friends while I’m getting the rhythm down with a newborn in a couple weeks. For that purpose, we have been using a couple workbooks but normally we don’t use workbooks regularly. We use a lot of library books, a lot of online searches, and a lot of science DVDs. More than anything, though, we use conversation. We talk about EVERYTHING. My day starts early with helping Eric get out the door for work. That wakes up everyone else, so then we have breakfast. We start the day reading something from the Bible together and praying. After that, all bets are off! 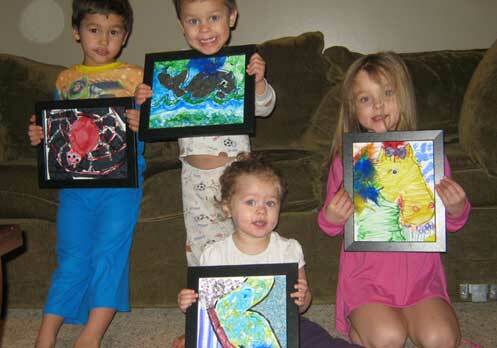 They love to color… draw and design, create things with scissors and glue and empty cereal boxes. They play together quite a bit, making up storylines and dramatic dialogues. When it’s warm weather, they are outside EVERY day, finding creatures and plants to identify. A few times a week, we end up going to run errands, visit with friends, or spend time at the library. After lunch, the youngest takes a nap and I take some time to connect with the other three with a kitchen table project or stacks of books. Sometimes we get the wiggles out by dancing around the house! Then they help clean up before Eric gets home. Eric wrestles with them for a bit when he walks in the door and then we get dinner going. He reads to us from the Bible before dinner, we eat, and then we usually watch something together. Then bedtime rituals and we start over the next day. I think I have always unschooled, in some sense of the word. My adventure is still brand new, but I’ve always known I couldn’t follow a hard and fast plan. We used to do more workbooks when my oldest was 4 years old, just whatever kind of preschooling busywork we could find. When she hit a wall and started refusing to even look at them, I knew something had to change. That’s when I found a name for the kind of schooling I was interested in. For two solid months, we did nothing that even resembled school WORK. I read and read and read about unschooling, talked it over to death with my mom and my husband, and worked at peeling back my own presuppositions. It was God’s timing for sure because I was starting to get bent out of shape over my oldest’s resistance to phonetic reading. Now I’m able to let her do it her way instead of making us both upset. The other negative that comes to mind is more of a community issue – if there are other unschooling families in my area with very young kids (as opposed to teenagers), I cannot seem to find them! Sometimes my kids want to call a friend or invite them to play, but all their close friends are in school. We have a MOPS (Moms Of PreSchoolers) group we go to, but it’s only twice a month. “And this is my prayer: that your love may abound more and more in knowledge and depth of insight so that you may be able to discern what is best and may be pure and blameless for the day of Christ, filled with the fruit of righteousness that comes through Jesus Christ–to the glory and praise of God.” That’s what it’s all about, for our family. Thanks, Victoria, for sharing this unschooling portrait with us! If you’d like to share YOUR family’s story, find out how here!